Ah, the difficult middle book of the trilogy! 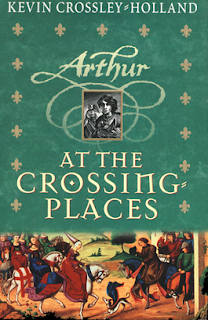 It's always a tricky prospect, and while I would read with joy and delight any book by Kevin Crossley-Holland, Arthur at the Crossing-Places is for me the least satisfying of this series (I'm including Gatty's Story here). Appropriately perhaps for a hinge-book, this volume finds Arthur treading water. He is now squire to Lord Stephen, who is preparing to leave on the crusades; but by the end of the book, they still haven't left. Most of the book is taken up with Arthur watching events unfold in his seeing stone, the adventures of King Arthur and his knights. Frankly, the array of ladies in distress, gallant knights and evil-doers to be overcomes, challenges and jousts and romances, becomes a little dizzying. In the real world, Arthur is troubled by his parentage; he has discovered that the unpleasant Sir William is his father, while his mother remains unknown. He wants to find her, but doesn't know how, and again, the book finishes with this issue unresolved. But I don't read Kevin Crossley-Holland for the story, really, but for his glorious, brightly-coloured language, which glows like a stained glass window or an illuminated manuscript. And for the sake of that, I'm happy to be frustrated on the plot front. 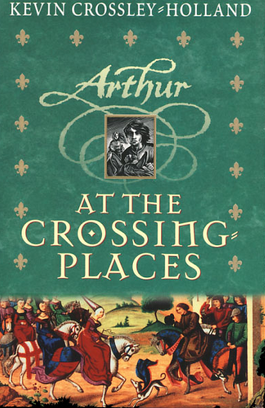 Arthur at the Crossing-Places was the last book of this series I managed to buy, so I've read them (re-read them) all out of order. But now they are all happily lined up on my shelf, and I'm very pleased to see them there, complete. I think these are books I will go back to again and again in years to come. 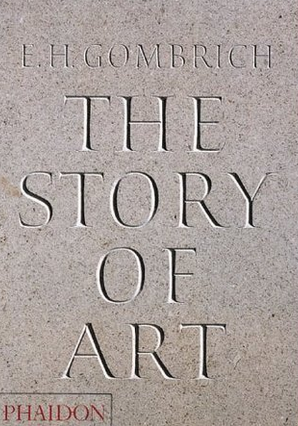 So I decided to Learn About Art and this massive tome (first published in 1950, last updated in 1989) seemed like the perfect starting point. It was originally intended for younger readers -- teenagers at a guess -- and though it has many, many, MANY pages, there are loads of illustrations and the text is not too dense. I think I remember art students at my school lugging this around back in the 1980s. It has taken me many weeks to wade through this history, a chapter at a time, and I'm not sure how much of it I will retain long-term. There is a heavy emphasis on Western art and particularly painting, but hey, you can't cover everything and since my ignorance is pretty much total, it was just as well to chip away at one area. 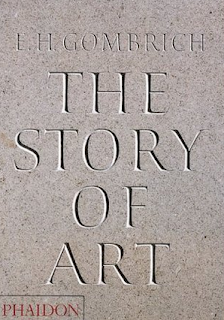 E. H. Gombrich succeeds in laying out a fairly coherent narrative trail by framing each era of art as an attempt to solve the problems thrown up by the one before, which was an interesting, and to me, novel way to look at it. And best of all, now that I've finally finished it, I feel incredibly virtuous! Despite (because of?) working for international music companies for more than a decade, I am not really a music person. I very rarely listen to music these days, and when I do, it's always an old favourite album and not anything new. The exception to this rule is the wonderful mix discs made for us by our friend David (through whom both Michael and I got our music jobs...). 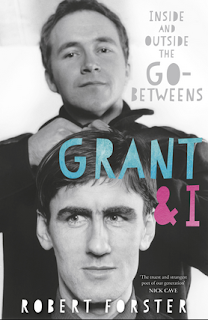 And it was David who gave me Robert Forster's Grant and I for my birthday, knowing that one of the albums I return to time and again, the soundtrack of my twenties, is the Go-Betweens' 16 Lovers Lane. This is the story of a band, a musical journey, and most of all, a friendship. Grant McLennan and Robert Forster found each other as sensitive outsiders at university in Brisbane, back when Queensland was a black hole ruled by Joh Bjelke-Peterson. Robert taught Grant how to play guitar; Grant introduced Robert to arthouse cinema. The union of two singer-songwriters gave their band an unconventional structure; it became both a strength and a weakness, as the Go-Betweens fought for creative and commercial success in the UK, Europe, the US and at home in Australia -- two steps up the ladder, then another slide down. The Go-Betweens never became 'big,' but they certainly gathered a devoted following, despite Grant and Robert splitting the band and going their separate ways for a decade before coming together again. 'There's bad blood between us' is a line from 16 Lovers Lane, before it all fell apart, but it sums up a period when the long hard slog of being in a not-quite-successful enough band and the tensions of personalities and relationships took their toll. At different times, Robert was going out with the drummer, Lindy, and Grant was going out with Amanda, the violinist, and though at times love fuelled the music, there were times when this history proved destructive. I loved how Forster describes the memory of writing a strong song as setting off a 'flare' in his mind, illuminating a particular room at a particular moment in time: the carpet, the way the light fell, a half-open door, Lindy applying makeup in the bathroom. Grant and I is a wonderful, moving story of a creative partnership, and it's sent me searching for all the music, both from the Go-Betweens and from McLennan and Forster's solo work, that I missed along the way. I'm so glad that I did. This is an important, heart-breaking memoir, sometimes zingingly funny, sometimes painfully sad, the kind of book that leaves feeling winded, like someone snuck up while you weren't looking and punched you in the guts, but because you needed it. Maxine Beneba Clarke grew up in the Sydney suburbs in the 1990s, daughter of British immigrants who were born in the West Indies, her mother an actress, her father a university mathematician. This is the story of Clarke's Australian childhood, the slow dawning of the realisation that in the eyes of many of her fellow citizens, her skin colour sets her apart -- sometimes perceived as exotic ('where are you from?' 'can you show us some tribal dances? '), but most often as inferior. Clarke's account of the daily, bruising, numbing, casual and deliberate racism she encountered as a child and adolescent (and still encounters) is illuminating (to me) and horrible. It made me feel deeply ashamed, and angry, and sad, because I know things are no better now. 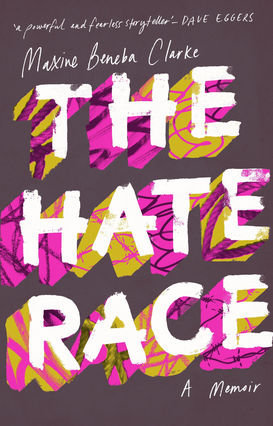 I think this book is being marketed as an adult memoir, but it should be required reading for every teenager too. I borrowed David Burton's memoir How To Be Happy from the library for the Convent book group, as next month's theme is Non-Fiction. 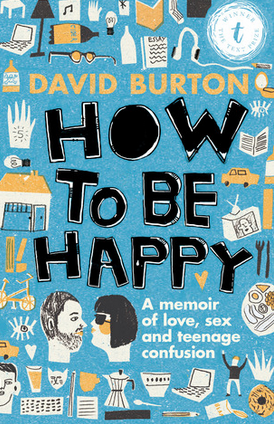 How To Be Happy, winner of the Text Prize, is funny, wry, engaging and honest. Reading it also made me feel very anxious. It took me straight back to my own adolescent and young adult struggles with anxiety and depression, and forced me to face the fact that my daughters are also in the thick of those difficult years and may well have a similar experience. Not comfortable reading. But I think this is a valuable book. It reassures us that there is help available, that hard times and grief can be survived, that friends are important and families can endure. David Burton is now a playwright in Brisbane and in a loving relationship (at least he was when the book was written). He is still young; he may not be out of the woods yet. I hated being young. It wasn't the best time of my life, it was the most miserable, the most uncertain, stressful and painful time. I wouldn't go back there for quids. Maybe that's why I write for kids and young people, because when I was young, books were my lifeline, my escape, and the promise that there was more to life than confusion, fear and sadness. Wow, that got dark quickly -- I didn't mean it to! And How To Be Happy is not a dark book, though it touches on some dark material; it ends on a promise of hope. Read it. I relished Kate Summerscale's previous non-fiction exploration of a Victorian-era crime, The Suspicions of Mr Whicher, an absorbing and sometimes shocking account of one of the first modern-style murder investigations. 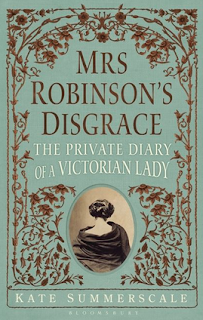 Mrs Robinson's Disgrace is also an examination of a Victorian scandal, but this time based in the newly-minted divorce courts rather than the Old Bailey. Isabella Robinson is unhappily married, bored and depressed. She consoles herself by writing in her private diary, recounting her attraction to various men and ultimately, her intimacy with one of them. Alas, while Isabella is ill and feverish, her husband discovers her diary, reads it with mounting rage, and demands a divorce for adultery. The only evidence is her diary, but can it be trusted? Or did Isabella, as her alleged paramour insists, invent the whole story? Based on court records and other research, Mrs Robinson's Disgrace gives Summerscale the opportunity to explore all kinds of threads concerned with female sexuality, Victorian morality, truth and fiction, the romantic imagination, marital cruelty, and the emergence of scientific, rational approach to sexual desire. All this is very interesting, but unfortunately I found Isabella Robinson, though intelligent and dealt a rotten hand in husbands, rather wearing company. She was rightly outraged that her husband had violated the privacy of her journal. Some words are not meant to be shared with others. Alas, Isabella's diary, like so many unedited diaries, is repetitive, self-serving, over-written, exaggerated and rather dull. That doesn't mean it wasn't valuable for her to write it; my own diaries, more than a hundred years later, were pretty similar! But I would shudder if they were shared with the general public, and I fear Isabella Robinson would probably feel the same way. Bought Boy: Tales of Childhood on the Kindle as my library had deleted their two copies since I last checked! Why? There seems to be this drive by libraries to clear out their back catalogue and only stock new books. When someone says, this place looks like a bookshop, they take it as a compliment. It's not. Libraries should not be faux-bookshops, they should be repositories of history, oddities, overlooked classics ripe for discovery. I know they can't stock everything, but still, it's disappointing when well-loved books like Roald Dahl's autobiography are unceremoniously binned. Perhaps calling Boy an autobiography is a bit of a stretch; it's more like a highlights reel, with, as they say in footy circles, some mayo on the top. 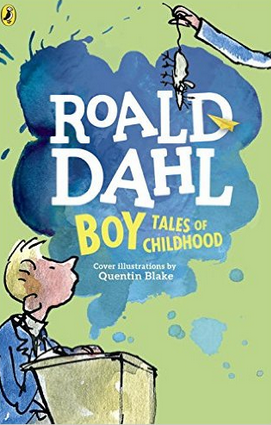 Roald Dahl selects the most memorable events of his childhood and shares them in his trademark highly-coloured style. There are dead mice, operations without anaesthetic, and lots and lots of flogging. Dahl attended British public schools in the 1920s and 30s and never got over his outrage that masters and senior pupils were licensed to assault younger boys in the name of discipline - not just a tap on the bum, but real, bruising, blood-drawing injuries. 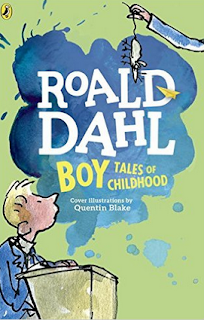 Regulars readers may know that I'm not a massive fan of Roald Dahl's writing; the celebrated streak of darkness and fondness for the gross side of life does not appeal to me and never has. But I found Boy a galloping, engaging read. I took it on the train to amuse me on the way to and from a school visit in Caulfield, and I was started and disappointed when it finished before my train reached Richmond! I might even read the sequel, Going Solo. But I'm not promising anything. Well, unless you've been living under a rock, you know how this story ends. Our Bulldogs DID win a preliminary final, gaining entry to the Grand Final for the first time since 1961. We watched the astounding victory (underdogs for the third game in a row...) on cable TV in our hotel room in Wellington. A couple of days earlier, a random stranger had bounced up to Michael in the Auckland Museum and wished us luck (Michael happened to be wearing a jacket with a very discreet Bulldog logo attached). We made it home in time to secure tickets. We were there, high up in the Southern Stand, to witness the game. We chewed out nails, plaited the tassels on our scarves, cheered and howled and roared. And before the siren sounded, I was already in tears. Anyway, while we were away, I read a couple of books: The Spire, by William Golding, about a medieval priest who is driven to add a spire to his church, against the warnings of his master builder, and the effects of his misguided vision on the community around him; and also Landmarks, by Robert Macfarlane, an absolutely beautiful book which examines some of Macfarlane's favourite nature writers, and also gathers a glossary of local terms for landscape and weather, words that describe with precision and poetry the interplay of water and air, earth and sky. Macfarlane laments that with the loss of this language, we lose our ability to really see what lies around us. This immediately led me to think of the tragic loss of Aboriginal languages and place-names, which perform the same function of knitting together people, spirit and place. And it felt as if New Zealand, with its proliferation of Maori place-names, and its bi-lingual signage, is miles ahead of Australia in recognition and preservation of local language. But since I finished Landmarks, nearly all my reading has been about football, and that glorious, thrilling victory: match reports, interviews, newspaper articles, blog posts... and I still haven't even unwrapped the Footy Record!! This post has already gone on long enough, so I will conclude with a simple, joyous shout of GO DOGS!